At first glance, it’s hard to know what’s happening in this picture. 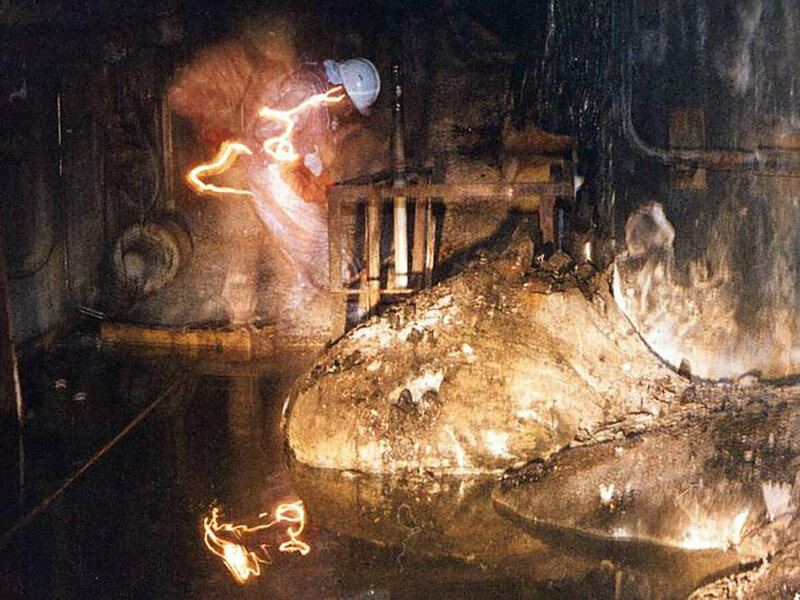 A giant mushroom seems to have sprouted in a factory floor, where ghostly men in hardhats seem to be working. But there’s something undeniably eerie about the scene, for good reason. You’re looking at the largest agglomeration of one of the most toxic substances ever created: corium. Remarkably, he’s probably still alive. The story of how the United States got a hold of this singular photo of a human in the presence of this incredibly toxic material is itself fraught with mystery—almost as much as why someone would take what is essentially a selfie with a hunk of molten radiated lava. This picture first came to America in the late 1990s, after the newly independent Ukrainian government took over the plant and set up the Chornobyl Center for Nuclear Safety, Radioactive Waste and Radioecology (spelling often gets changed as words go from Russian to English). Soon after, the center invited other governments to collaborate on nuclear safety projects. The U.S. Department of Energy tapped the Pacific Northwest National Laboratories (PNNL)—a bustling science center up in Richland, Washington—to help. At the time, Tim Ledbetter was a relatively new hire in PNNL’s IT department, and he was tasked with creating a digital photo library that the DOE’s International Nuclear Safety Project could use to show its work to the American public (or, at least, to the tiny sliver of the population that was online back then). He had project members take photos while they were in Ukraine, hired a freelance photographer to grab some other shots, and solicited images from Ukrainian colleagues at the Chornobyl Center. Intermixed with hundreds of images of awkward bureaucratic handshakes and people in lab coats, though, are a dozen or so shots from the ruins inside Unit 4, where 10 years before, on April 26, 1986, a reactor had exploded during a test of the plant turbine-generator system. As radioactive plumes rose high above the plant, poisoning the area, the rods liquefied below, melting through the reactor vessel to form a substance called corium, perhaps the most toxic stuff on Earth. Corium has been created outside of the lab at least five times, according to Mitchell Farmer, a senior nuclear engineer at Argonne National Laboratory, another Department of Energy center outside of Chicago. Corium formed once at the Three Mile Island reactor in Pennsylvania in 1979, once in Chernobyl, and three separate times during the Fukushima Daiichi meltdown in Japan in 2011. Farmer creates modified versions of corium in the lab in order to better understand how to mitigate accidents in the future. Research on the substance has found, for example, that dumping water on it after it forms actually does stop some fission products from decaying and producing more dangerous isotopes. Of the five corium creations, only Cherobyl’s has escaped its containment. With no water to cool the mass, the radioactive sludge moved through the unit over the course a week following the meltdown, taking on molten concrete and sand to go along with the uranium (fuel) and zirconium (cladding) molecules. This poisonous lava flowed downhill, eventually burning through the floor of the building. When nuclear inspectors finally accessed the area several months after the initial explosion, they found that 11 tons of it had settled into a three meter wide grey mass at the corner of a steam distribution corridor below. This, they dubbed the Elephant’s Foot. Over the years, the Elephant’s Foot cooled and cracked. Even today, though, it’s still estimated to be slightly above the ambient temperature as the radioactive material decomposes. Ledbetter’s not able to remember exactly where he got these images. He compiled the library almost 20 years ago, and the website on which they were hosted is in rough shape; only thumbnails of the images are left. (Ledbetter, who still works at PNNL, was surprised to learn that any of the site was still publicly accessible.) But he’s sure he didn’t hire someone to take photos of the Elephant’s Foot, so they likely were sent in by a Ukrainian colleague. In 2013, Kyle Hill stumbled across the image, which had been shared several times on the internet in the ensuing years, while writing a piece about the Elephant’s Foot for Nautilus magazine, and tracked it back to the old PNNL site. Following his lead, I went back there to look for more details. After a little digging through the site’s CSS coding, I was able to locate a long-lost caption for the image: “Artur Korneev, Deputy Director of Shelter Object, viewing the ‘elephants foot’ lava flow, Chornobyl NPP. Photographer: Unknown. Fall 1996.” Ledbetter confirmed the caption matched the photo. Korneev turns out to be an alternate spelling for Korneyev. Artur Korneyev is a dark-humored Kazakhstani nuclear inspector who has been working to educate people about—and protect people from—the Elephant’s Foot since it was first created by the explosion at the Chernobyl nuclear plant in 1986. The last time a reporter spoke to him, as far as I can tell, was in 2014, when New York Times science reporter Henry Fountain interviewed him in Slavutich, Ukraine, a city built especially to house the evacuated personnel from Chernobyl. I wasn’t able to locate Korneyev for an interview, but it’s possible to put together clues embedded in the photos to explain the image. I looked through all the other captions of photos similar photos of the destroyed core, and they were all taken by Korneyev, so it’s likely this photo was an old-school timed selfie. The shutter speed was probably a little slower than for the other photos in order for him to get into position, which explains why he seems to be moving and why the glow from his flashlight looks like a lightning flash. The graininess of the photo, though, is likely due to the radiation. For Korneyev, this particular trip was only one of hundreds of dangerous missions he’s taken to the core since he first arrived on site in the days following the initial explosion. His initial job was to locate the fuel deposits and help determine their radiation levels. (The Elephant’s Foot initially gave off more than 10,000 roentgens an hour, which would kill a person three feet from it in less than two minutes.) Soon after that, he began leading cleanup efforts, sometimes even kicking pieces of solid fuel out of the way. More than 30 workers died from Acute Radiation Syndrome during the explosion and ensuring cleanup. Despite the incredible amount of exposure, Korneyev kept returning inside the hastily constructed concrete sarcophagus, often with journalists in tow to document the dangers. In 2001, he brought a reporter from the Associated Press back to the core, where the radiation still measured 800 roentgens an hour. In 2009, Marcel Theroux, the celebrated novelist (and son of writer Paul Theroux and cousin of actor Justin Theroux) wrote an article for Travel + Leisure about his trip to the sarcophagus and the mad, maskless guide who mocked Theroux’s anxiety as “purely psychological.” While Theroux refers to him as Viktor Korneyev, it’s likely the man is Artur, as he made the same dark joke he would a few years later in a New York Times article. His current status is murky. When the Times caught up to Korneyev a year and a half ago, he was helping to plan construction of a $1.5 billion arch that, when finished in 2017, will cap the decaying sarcophagus and prevent airborne isotopes from escaping. In his mid 60s, he was sickly, with cataracts, and had been barred from re-entering the sarcophagus after years of irradiation. The mysterious Cold War base is now an eerie, crumbling ruin.